On this page, I provide some information about my wide-field binoculars, the Omegon 2.1 x 42 wide-field binoculars for star field observing. Note: The Omegon 2.1 x 42 wide-field binoculars for star field observing seem to be more or less identical to the Vixen SG 2.1 x 42 wide-field binoculars for star field observing (see Basic Data and Links below). 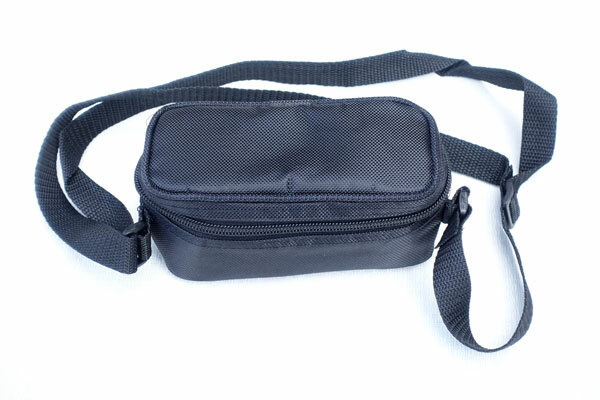 The Vixen has a better bag, a significantly higher price, and is said to be made in Japan, while the Omegon is made in China. On the other hand, it does not have a filter thread, whereas the Omegon offers a 2" filter thread. Note: See also page My Binoculars. I also list the technical data of the more or less identical Vixen SG 2.1 x 42 mm.
? / ? means that I found different data in different sources. *) Due to the large exit pupil the field of view varies with interpupillary distance (from Vixen Website). 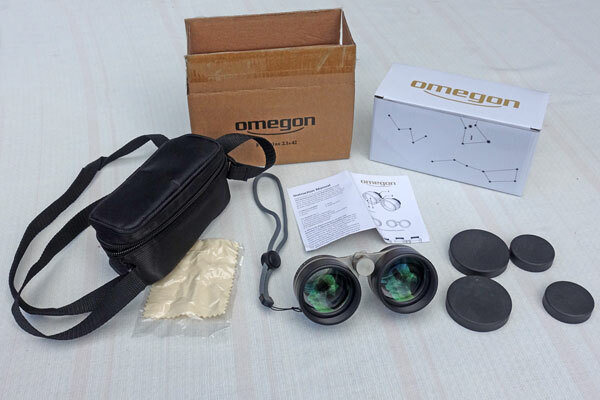 The Omegon wide-field binoculars are better suited to observing constellations and star patterns as well as wandering along the milky way than for observing specific sky objects (exception: some very large open star clusters). Typically, the dates refer to my first observation. On the day of its arrival I took a lot of photos of the Omegon wide-field binoculars (see above) and tried the binoculars out on terrestrial targets during the day. At night, I tried the binoculars at the starry sky (at New Moon), and on the following night as well. This is probably enough stuff for "first experiences"! First of all, I was amazed at the weight of the Omegon wide-field binoculars! If you read "375 g" in the technical data, this value does not appear to be low, but not heavy either. But in practice, that is, in my hands, the binoculars feel surprisingly heavy. A fatigue-free wandering along the Milky Way seemed impossible at first sight. But at night I had no problems with the weight of the binoculars, especially when I was sitting in an armchair. The Omegon wide-field binocular is a double Galileo-type telescope. This type of telescope consists of a collecting lens and a dispersing lens. Meanwhile, I found diagrams of its "Vixen twin," and there are more than two lenses used, which explains the high weight. 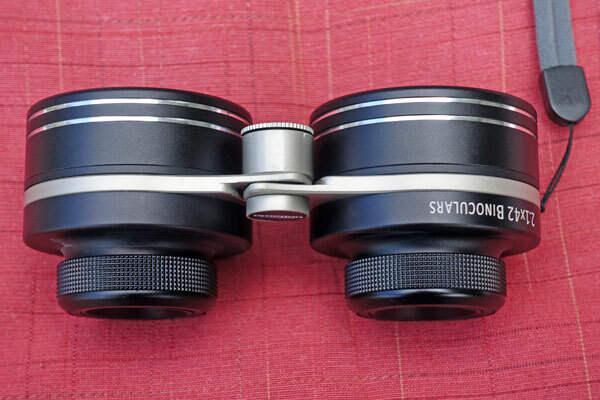 Due to the design, there are no prisms and no mechanical coupling of the two eyepieces. The mechanics of the binoculars are thus kept very simple and should not contribute much to the weight. 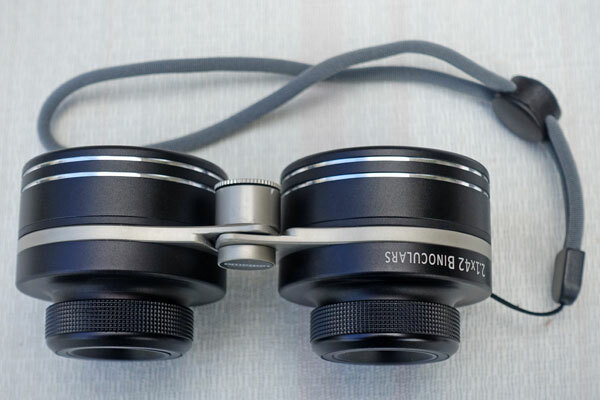 Due to the design, the eyepieces of these binoculars are not mechanically coupled. They are focused individually, and in the same direction of rotation. 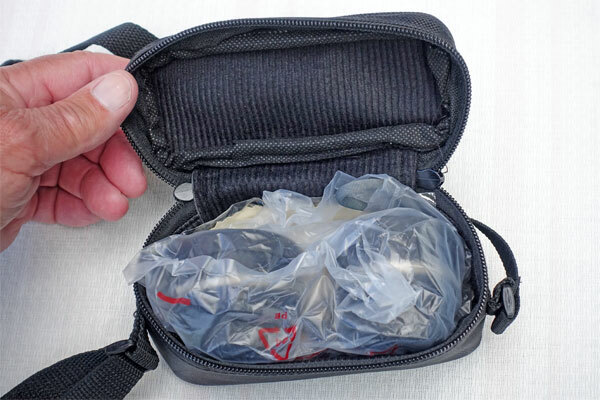 Single focusing can cause problems when using the binoculars on moving objects during the day. Until both eyes are focused on an airplane or a flying bird, these probably have vanished... When observing the nightly sky or in the opera, the single focusing is of course not a problem, because the distances are constant. I took my very first look through the Omegon binoculars in our kitchen - and I was amazed at the fairly strong pincushion distortions that the binoculars create. In natural environments these are, of course, not so conspicuous, but when the binoculars are used as opera glasses they certainly will be. Outside during the day, when looking at dark objects (flying birds, twigs) against a bright background, I sometimes noticed quite colorful, partly rainbow-colored color fringes. Sometimes the fringes disturbed me more, sometimes less... At night, the main application of the glass, these fringes should be less conspicuous. On closer inspection, I also found widely blurred edges, the least at the top, a little stronger on the left and right side, and the most pronounced at the bottom. This was similar for both eyes, so it seems to be inherent to such binoculars (more on this further down). To what extent this would disturb me at night, I was, of course, not able to judge in daylight. Finally, despite multi-coating, the binoculars may show sun reflections when observing while the sun is shining; at night, reflections should not disturb the view (but I have to wait for the moon to judge this...). 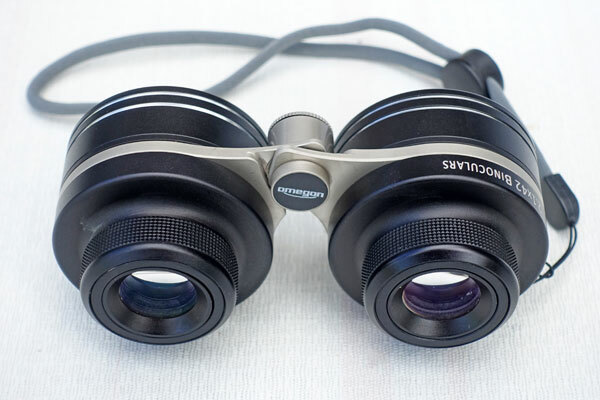 Overall, the Omegon wide-field binoculars show a number of optical deficits when observing in daylight, such as fairly strong pincushion distortions, wide blurred edges, slight color fringes, and reflections of the sun. In view of its steep price tag of 179 EUR, I had not expected such deficits. In the meantime, however, I found several sources stating that this is typical for Galileo-type binoculars (more on this below). What Makes the Omegon Binoculars Special when Observing in Daylight? 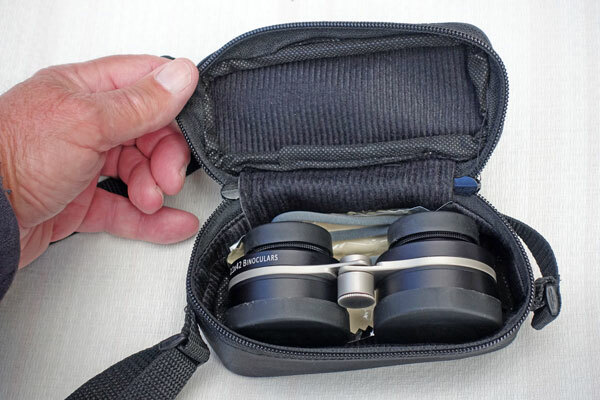 A customer writes about the Omegon binoculars: "Earth observation by day, simply class. Only 2x magnification, but you can still see everything better and clearer and "closer"! 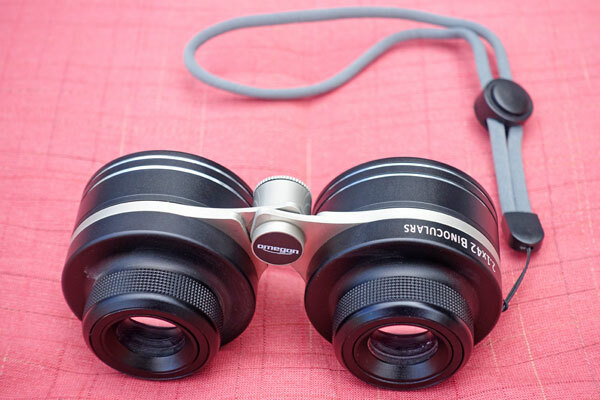 A great alternative to larger binoculars for daytime observation." 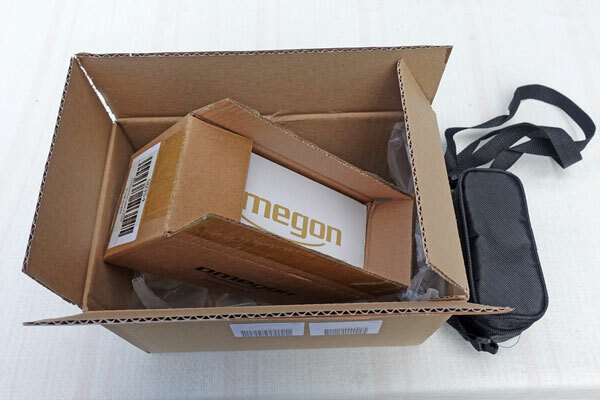 After my first impressions from daylight use, I was not too enthusiastic of these Omegon binoculars, because I found a number of shortcomings with respect to image quality. But I was also able to find out that the Omegon binoculars let you see details easier and clearer. I tried this, for example, on our wine with its grapes, and also in our garden and surroundings. Then I took out our little Leica Trinovid 10 x 25 binoculars and tried to look at the same targets. Roughly speaking, this was not possible because the Leica glass enlarged too much! The next day, I looked again at the darker parts in the field of view and noticed that they were clearly brighter compared to the impression that my eyes delivered. This also contributes to a better recognition of details. With my Leica binoculars (and anyone else), I look at magnified details and objects far away. 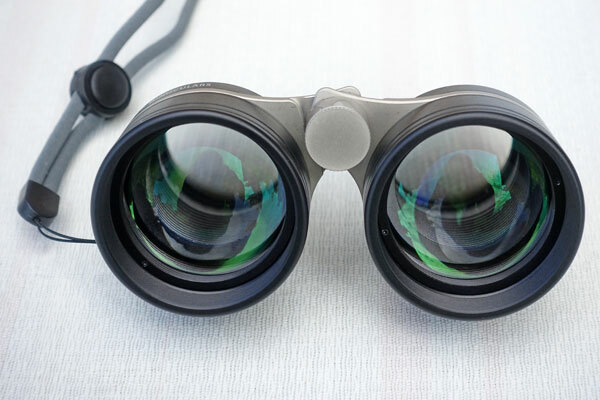 The Omegon binoculars provide me with an overview of what I can already see with my eyes, but I can see everything much more precisely and clearly, even or especially in shadow areas. In addition, I do not lose orientation as I often do with binoculars having a higher magnification, and can easily and quickly establish a relationship to the original. 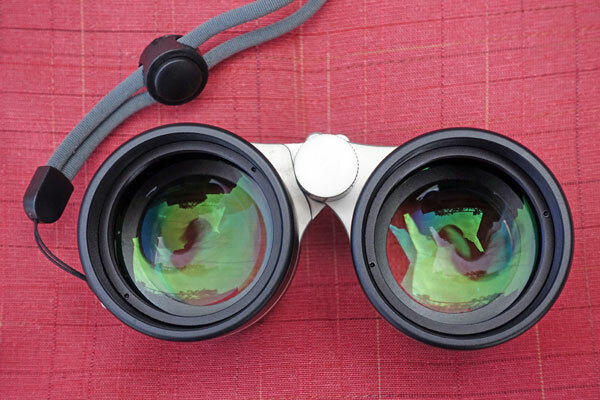 Since binoculars basically increase the interpupillary distance, the image also appears more vivid and three-dimensional - and everything is slightly larger and clearer. Now let me turn to my experiences at night, taken from my first and second night with the Omegon binoculars! As expected, the image deficits disturbed me less at night than during the day, and I focused more on observing than on the image quality problems. I will continue to try to gain experiences and report these here, though. What Makes the Omegon Binoculars Special at Night? First of all, I noticed that the apparent field of view of the Omegon wide-field binoculars is smaller than that of my normal binoculars. Therefore, hopes for a kind of "panorama effect," as I may have secretly kept, were unfortunately in vain. After comparing this "empirically" at first, I was also able to confirm this numerically. The Omegon binoculars have an apparent viewing angle of 26° (the true one is 12°), for my 10 x binoculars I calculated one of a little more than 50° (the true one is about 5°). This is twice as much and corresponds to that of a Plössl eyepiece. In practice, however, I do not find the difference that great. Thus, the primary differences to normal binoculars are: a lower magnification, you see fewer stars, and you can oversee a larger area of the sky (12° instead of 5° at a magnification of 10 x). Compared with the naked eye, on the other hand, you only see a small section of the sky, everything gets a little larger, and you see significantly more stars. But what does this mean in practice? It means, for example, that the sky-W (Cassiopeia), the Big Dipper without or even with handle (part of Ursa Major), the northern crown (Corona Borealis) or the lyre (Lyra) can be seen as a whole. This way, you do not have to wander along them, and you get a good impression of their shape, which unfortunately gets lost when moving around. The difference to the impression that you get with the naked eye is quite considerable and visible! The linear dimensions increase by a factor of 1.5 (1.5 x 1.5 = 2.25, i.e. slightly more than 2.1...), so everything becomes a bit larger. You also see significantly more stars than with the naked eye. Depending on the source, you can see stars of 1-2 size classes less than with the naked eye (i.e. instead of 6 M, also stars of 7-8 M), which should correspond to about 2-4 times the amount of stars. In addition, with the Omegon binoculars I can easily keep the orientation in the sky, which I often lose when using higher magnifying binoculars, and I also like to switch between the eye impression and the view through the Omegon binoculars. This is fun! Compared with my binoculars and the eye, the contrast of the Omegon binoculars seemed lower, or the sky background much brighter, so that I perhaps might not see one or the other star. The sky over Mühlhausen is unfortunately very light-polluted anyway (even at New Moon). Initially, I suspected that this might correspond to the effect that shadow areas appear brightened during the day. On the second night I examined this again and found that in medium darkness the center of the field of vision appeared darker than the edges. At even greater darkness, the entire image field appeared to be reasonably dark. This corresponds a little to what other testers write, namely that the gain through the Omegon/Vixen binoculars is limited in brighter, light-contaminated skies and only comes into effect when the sky is really dark. Finally, I was interested in finding out, which DSO objects I would be able find with the Omegon binoculars and tried the Hercules cluster (M 13, 15') and the Coat Hanger (Cr 399, 60'). While I saw a triangle in the binoculars whose central point of light was M 13, I saw only a tiny shimmering dot in the Omegon binoculars. At the Coat Hanger, I saw some fine glittering dots, but I was not really able to recognize the shape. On the second night, I tried to use averted vision with more success. With larger open star clusters, I will certainly have more success. On the second night I directed the Omegon binoculars at the Andromeda galaxy M 31 and saw only a small diffuse light spot, probably only the bright core of the galaxy. It did not look as fantastic as the advertising promises! show the sky background relatively bright when the sky is not really dark or light-polluted. When I bought the Omegon wide-field binoculars, I did not know much about it, except for a few comments from customers. This is also how my first, perhaps somewhat naive experiences with it are to be understood. 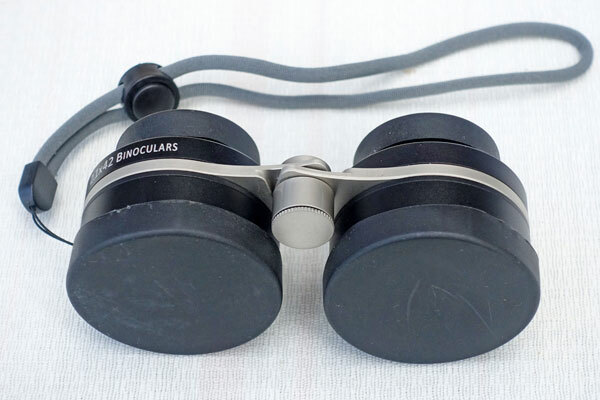 Meanwhile, I found out that there are more or less identical widefield binoculars from Vixen (Vixen SG 2.1 x 42), which appeared earlier on the market, as well as some other binoculars of similar design, like the S'Gucki, which is distributed in Switzerland, but was originally also sold over different channels. In his test (Link from Vixen to the test; in German) of the Vixen SG 2.1 x 42, Daniel Fischer writes that "... - only in its central zone the stars are reasonably point-shaped: towards the edges they are distorted and more and more clearly elongated. Thus, in principle, the entire Big Dipper fits tightly into the field of view, but practically only individual asterisms can be seen sharply: The Hyades (about 5°, added by me) are already one of the largest groups of stars that can be seen sharply at a glance." Fischer further writes that, as a result of the Galilean design, the size of the field of view strongly depends on the distance of the eye from the eye lens of the eyepiece. 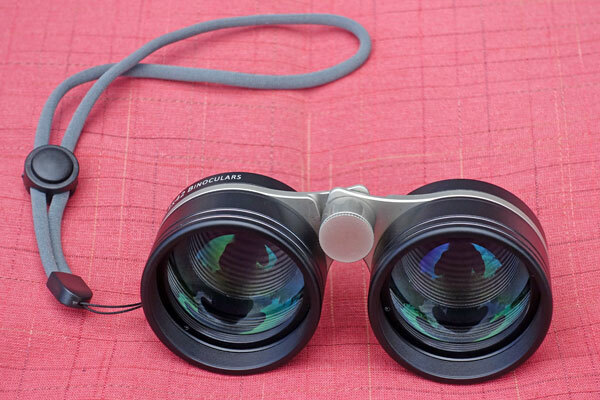 Even a few millimeters distance would lead to significant losses, and binoculars are not suitable for spectacle wearers. In his test of the Vixen SG 2.1 x 42 (in German), Alexander Kerste is, like me, not impressed by the sight of the Andromeda galaxy (M 31) in the Vixen binoculars ("a nebula, but quite small"). He writes that the definitely existing blurred edges disturb him only if he pays attention to them. Maybe I will get there on day! Like Fischer, he states that the Vixen widefield binoculars are less suited to spectacle wearers. 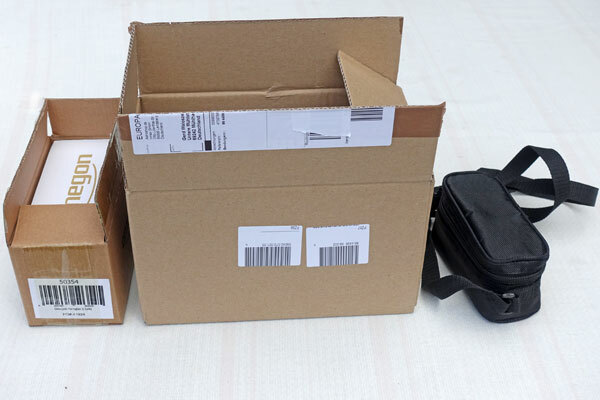 When I ordered the Omegon wide-field binoculars, I was not sure whether I would like it or whether I would send it right back. At the moment, I am still wavering about this decision. The binoculars have clear deficits with respect to to image quality, but these are particularly noticeable during the day. How far they will disturb at night, I have not yet been able to decide for myself. I had not expected this regarding the steep price tag of 179 EUR! In the meantime, however, I found several sources stating that this is typical for Galileo-type binoculars. Thus, I will have to live with these shortcoming when I keep the binoculars.